Serámika beige òf maron ku un kraltjie di kolo, varia. Kadena i armbant EM ta trahá di un kombinashon di serámika di EM i plèstik. Nan ta yuda e kurpa strukturá e líkido korporal pa medio di propiedatnan di resonansia di serámika di EM. Durante fabrikashon ta agregá puiru di serámika EM den kadena i armbant di serámika. E puiru ta sòru pa un mihó resonansia. Kadena i Armbant di serámika di EM-X Gold ta bunita pa usa i ta duna protekshon kontra radiashon di aparátonan eléktriko. Nan no ta pisá i ta bin den diferente koló. E ta un alternativa pa stimulá e sirkulashon di sanger. Bisti’é na garganta, pòls òf na enkel, (kaminda e koriente di sanger ta mas na superfisie). Bisti e kadena òf armbant mas tantu ku ta posibel pa mihó efekto. Ta ser bisá ku e kadena òf armbant ta aliviá doló i hinchá. Hende ta eksperensiá un sensashon agradabel ku ta oumentá e fluho di sanger na man òf pia. E armbantnan maron ta èkstra fuerte. The lightweight bracelets are available in different sizes and colors. EM necklaces and bracelets are made from a combination of EM Ceramics and plastic. Energized Ceramics give these necklaces extra energy. EM-ceramic powder is added in the manufacture of the EM ceramic necklaces and bracelets. The powder improves resonance. They help the body in structuring body fluids by means of ‘resonance’ properties of the EM Ceramics. 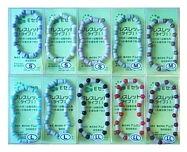 EM ceramic necklaces and bracelets are fun to wear and provide protection against radiation from electrical appliances. It is a good alternative to stimulate blood circulation. Wear them close to the bloodstream on the neck, wrist or ankle. Wear the necklace or bracelet as often as possible for best effects. EM necklaces and bracelets are said to alleviate aches, pains and swellings. When initially put onto the wrist or ankle some people experience a pleasant tingling sensation that appears to increase blood flow to either the hands or feet.